A good marketer thinks outside the box and is willing to go the extra mile (or two) to get results. When it comes to vacation rentals, there are so many marketing avenues that are rarely traveled. 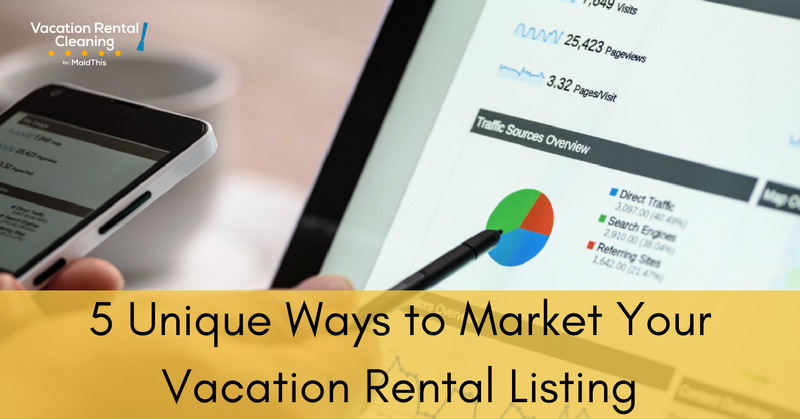 Here are 5 tips for hosts who want to take their vacation rental marketing one step further and NOT solely rely upon the vacation rental marketplace websites. Believe it or not, this is a fantastic way to get longer-term stays (think 2-4 week bookings). Back in the days before Craigslist and online job boards, hanging flyers at the local haunt was a tactic that really worked, especially for inexperienced workers with few connections. To this day, papers still hang from bulletin boards in Starbucks, and – most likely – at the local coffee shop around the corner. It may seem like a less-than-reputable place to find a vacation rental, but by including your website URL or listing site, potential guests have a way to verify your snazzy flyer is telling the truth. Be creative and include information about yourself to reassure renters they will be in capable hands, as well as staying at a relaxing vacation home. Provide a way for them to easily contact you as well. Rip-off tabs never get old! Social media is a go-to for marketing, so don’t be afraid to utilize the power of the share button. Consider setting up a dedicated Facebook page for your rental property where potential and past renters can ask questions, share photographs, and get information about their stays. This compelling social proof goes a long way in the realm of social media marketing. Another option is to simply link your listing to your personal Facebook page. Ask friends to share on their own accounts and your pool of potential future renters practically doubles. By asking your buddies to share your listing and spread the word in their own social media networks, it’s very likely they will end up helping you book stays with guests you might not have otherwise reached. If you want to take this to the next level, you can dive into Facebook Ads to start promoting your page to people who are looking to vacation in your city….yes, you really can get this specific with Facebook Ads! Repeat visitors are a vacation homeowner’s dream, especially if the guests are clean and responsible! But they don’t just appear out of nowhere – they need to have a reason to keep coming back. In a way, presenting your rental home in the best possible condition – with all its bells and whistles – is marketing enough. Providing renters a flawless vacation home and arming them with the best things to do/see/eat during their stay is a surefire way to turn guests into regulars. Get to know your renters and try to be available for questions or emergencies as much as possible. Guests can tell when an owner has put in a great deal of effort to make them feel as comfortable as possible – something that is not always found at hotels or other properties. Make your place stand out as a one-of-a-kind experience. Next, collect the email address of your renters and keep them updated on your property (see Step 4 for what to do after this….). Ideally, get your past renters to also “like” your Facebook Page from Step 2 so you always stay top-of-mind for them. Sending out a newsletter is a great way to keep in touch with past renters while also informing them and helping potential future guests get to know you as a host. Some information to include in a newsletter might be about special events happening in town or seasonal activities for families and friends that may be planning to vacation together. Even if you send an update just once a year, knowing you took the time to research and provide that information makes renters feel good about giving you their business. Start by setting up a free account with MailChimp. It’s a simple platform and will allow you to customize your newsletters so they look professional and as fancy or simple as you like. Blogging isn’t just for bloggers anymore; it’s one of the best ways to connect with an audience and put a face with a name. In this case, consider setting up a website with information about yourself as a host and the benefits of renting a vacation home (particularly, yours). In addition, your website is a great way for vacationers to find you online without even trying. They might be searching Google for events in a specific city or for “touristy things to do” and not actually be looking for a place to stay. But through the power of search engine optimization (SEO), they might just land on your website! How do you achieve that? By using your blog to write about local events, popular tourist destinations and other specifics about your city. The more you include on your blog, the more likely people are to find you. On top of keeping an updated blog, invest in a good website host. A strong online presence outside of vacation rental sites can take your marketing to the next level. It shows a serious dedication to maintaining the absolute best for your property and establishes a sense of trust between you and your renters. Take it a step further here by collecting email addresses to add to your MailChimp account. This is a great way to build up your email list so you can make the most of your newsletters. Overall, marketing will require some creativity and experimental tactics. Every property is different and has its own quirks and distinct features. Highlighting the uniqueness of your vacation rental is one of the best things you can do when it comes to drawing in renters; the more genuine your marketing is, the more authentic your results will be. Need a thorough cleaning before your next guests check in to your property? Contact us about turnover cleanings for your vacation rental.